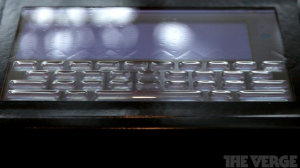 A physical keyboard that pops out of your touchscreen! This looks like something that would come out of a sci fi movie, but then.. The gadgets that do are often the best. The concept is a touchscreen which can physically transform, ejecting buttons or shapes from the screen itself. In this example the technology is used to make a tablet, or smart phones on screen keyboard become a physical one, in a n instant. It seriously is one of the coolest things i’ve seen, and hopefully we will see it on shelves in a few years. 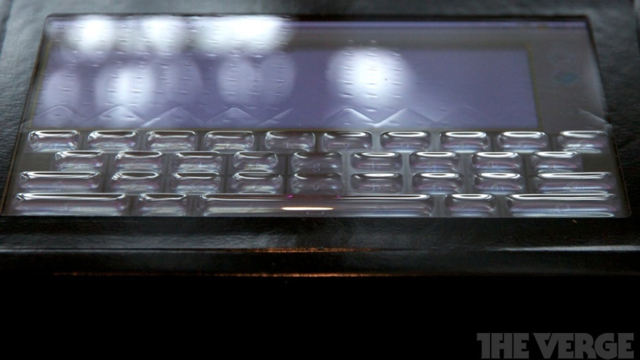 According to the Verge’s Nathan Ingraham, the tactus touchscreen prototype uses microfluidics to accomplish this feat. Beneath the outer surface of the screen, which appears to be a plastic membrane, are channels for a special oil to flow into reservoirs reserved for the keys of your keyboard. When flat, Ingraham says the channels are barely perceptible. Of course, this being a very very early prototype (and a nascent concept in general), the only pattern the screen can form is that of a QWERTY keyboard in landscape orientation. The idea is to someday be able to form multiple patterns in varying orientations, but for now the company is just trying to get the idea off the ground. Also here is an exclusive look at what other magical things can be accomplished with this technology.